These beads are definitely one of my favorite purchases every time I visit. I try to get a necklace and bracelet each time I go to Epcot. I love the idea that they are made from recycled park maps! 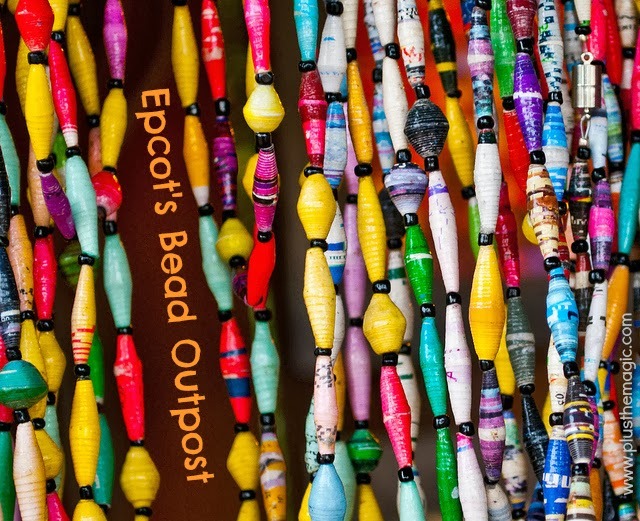 One thing I love about these beads is that they are a very unique gift item in a "World" of Disney! The perfect souvenir for Grandma or anyone else who may not be into the characters. It's easy to miss this outpost - good post to spread the word! How cool! I've passed the Bead Outpost I don't know how many times, but never knew about the recycled beads. Think I'll have to make time for an extended visit soon! I'm planning on going in about a week. Can't wait to get some.